Black Diamond Voyager Lantern. Black Diamond crossed a 140-lumen lantern with a 50-lumen flashlight to get the unique, ultra-versatile Voyager. 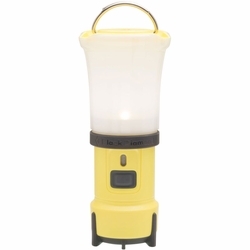 Combining a bright, non-glaring backcountry lantern with a powerful, precise flashlight, the Black Diamond Voyager lantern provides ultra-versatile lighting for post-sunset campsite activities. In lantern mode it produces 140 lumens of bright, dimmable, ambient, non-glaring light, and in flashlight mode it creates a strong 50-lumen beam. These two modes and a third dual mode (both lantern and flashlight on) are controlled from one convenient switch. From cooking dinner to going to the river for water, the Voyager is an extremely versatile addition to any camping kit.